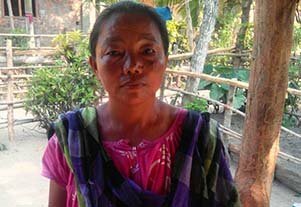 Pusma Mangar, Chaibasa Line, Bundapani Tea Garden, Alipurduar, West Bengal, is a 47-year-old tribal woman who lives in Bundapani, a closed tea garden in the heart of the Dooars region in West Bengal with her husband and 23-year-old daughter. Bundapani is not an exception; it is only one of the numerous closed tea gardens in the area. Malnutrition, unemployment, trafficking and school dropouts are daily occurrences in this abandoned tea garden. involved in sewing work because of her. Many children in the tea garden are illiterate due to a lack of facilities, poverty and other factors like lack of attention by their parents, migration to other cities for jobs etc. Alcoholism is also a serious problem in the area. In such circumstances, Pusma Mangar has taken the responsibility for the education of children needing support. The PRI representative of Bundapani Panchayat said, “She is our watch tower. There are tube wells in the garden because she has gathered labourers and gone to the local government officials to bring attention to the water crisis. She alerts us whenever there is a delay in entitlements like NREGA, Financial Assistance to Workers of Lockout Industry, State scheme to provide cooked food to old persons called SAHAY PRAKALPA.